Keep yourself covered in any situation with the new Accelerator Protector Jacket. Designed to protect the rider from the most extreme conditions you can find on a dirt bike, the shoulder, elbow, chest and back protector all work together to keep the rider safe and comfortable. 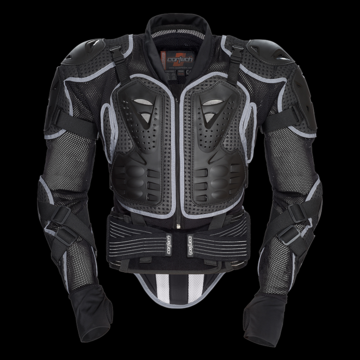 • High impact ventilated armor plates at the chest, shoulders and elbows. • Impact absorbing foam on the outer chest offers underarm protection. • Accommodates most leading neck braces. • Zip-off removable 5-plate articulated back protector with padded kidney belt. • Fully adjustable straps at the chest, forearm, upper arm and shoulder for a secure fit. • Adjustable padded dual closure waist belt. • Hook-and-loop fastener tabs secure chest plate to waist strap. • Soft ventilated mesh main body construction. • Elastic nylon wrist cuffs with thumb holes.